Bonnie Bond reviews bariatric surgery in Tijuana – Mx. Bonnie’s weight loss surgery was performed by a highly competent team of surgeons. 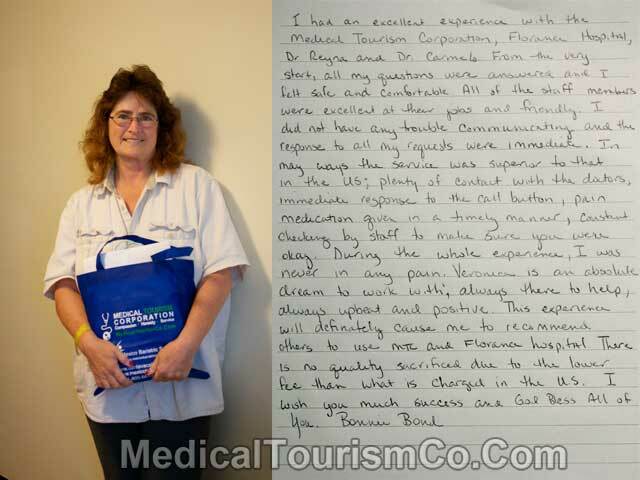 “I have had an excellent experience with the Medical Tourism Corporation, Florence Hospital, Dr. Reyna and Dr. Carmelo. From the very start, all my questions were answered and I felt safe and comfortable. All of the staff members were excellent at their jobs and friendly. I did not have any trouble communicating and the response to all my requests were immediate. In many ways the service was superior to that in the US; plenty of contact with the doctors, immediate response to the call button, pain medication given in a timely manner, constant checking by staff to make sure you were okay. During the whole experience, I was never in pain, Veronica is an absolute dream to work with, always there to help, always upbeat and positive. This experience wil definitely cause me to recommend others to use MTC and Florence hospital. There is no quality sacrificial due to the lower fee than what is charged in the US. I wish you much success and God Bless All of you. Tijuana – a primary medical tourism hub of Mexico – is a magnet for Americans seeking quality yet pocket-friendly bariatric surgery south of the border. The city is in proximity to San Diego and can be conveniently reached from the San Diego International airport. Med Tourism Co. has facilitated bariatric surgery of thousands of people in the Mexican border city. Here is another Tijuana weight loss surgery testimonial by an American who traveled all the way from Murfreeseboro, Tennessee for kick-starting his weight loss journey. For more such bariatric surgery reviews and testimonials, and a FREE WLS Quote contact us via the quote form on the right.